Hello lovely Friends!! Good news…I am happy to report that my floors are officially in!! Real progress, ya’ll. I still need to add the quarter round trim around the perimeter before I can call it done, but it is so nice to see it coming together! 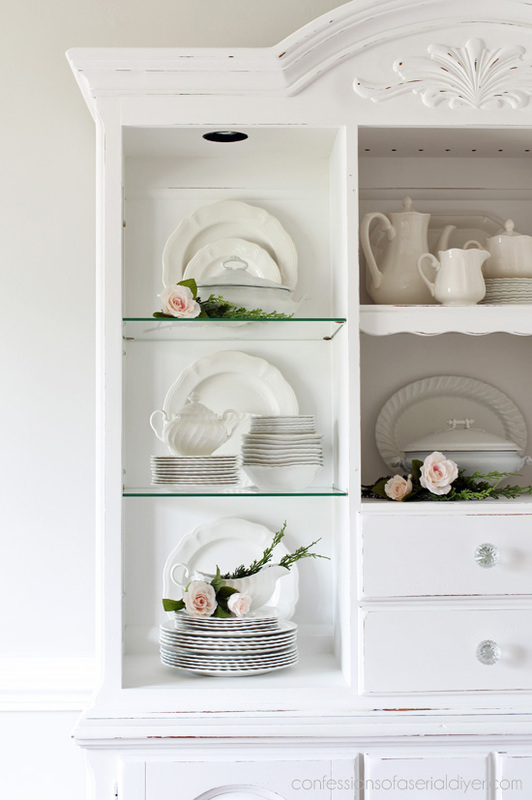 Today I am sharing my china hutch. This piece was the very first piece of furniture that I ever painted with chalk paint. I bought it back in 2000 as part of a dining room set. Now just imagine them together. I had taken the top off and had it in the garage for a couple of years. Then I decided I was going to sell it at our annual neighborhood yard sale. The night before, I had the bright idea to paint it, and so of course it never made it to the yard sale. Okay so I do miss the black damask paper that I had on the back before, or maybe I’m just not used to it yet. That’s three more boxes unpacked! I had to remove the paper from the back to paint. I also removed the chicken wire door I added a couple of years ago. It does look nice and clean now, but I will probably be on the hunt for a new paper or fabric eventually. Much better! So much more dainty. 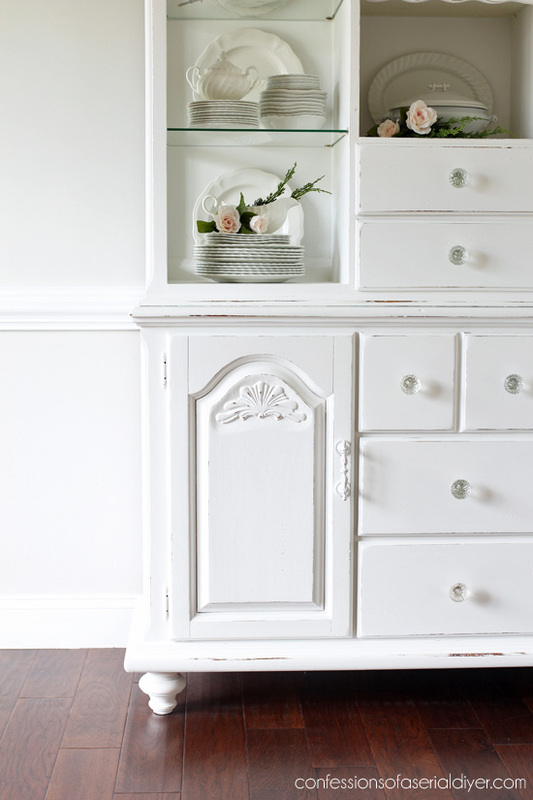 When I was trying to decide what I would use to refresh this hutch, I ended up going with my tried and true DIY chalk paint (recipe HERE) in Behr’s Bit of Sugar…it is just a little less stark white than the Ultra Pure White. So much better in my new dining room now. I used Miss Mustard Seed’s wax (affiliate) to seal since it has a very natural wax smell and I was doing this all inside. I quickly learned that it doesn’t go nearly as far as the Annie Sloan clear soft wax unfortunately. I loved this clock every time I went in there and finally broke down and bought it. I’m not sure if it will end up in here or in my office yet. My hutch is done, but this room has a long way to go! The table legs are painted, but I ran out of wax and had to order more. I am going to take the chairs outside and spray them with my sprayer, but that may have to wait a bit. In the mean time, I am on the hunt for fabric to recover the seats. I didn’t have any wall space in my old dining room, so it will take me some time to figure out what to hang in my new space. I’m not so quick with figuring out wall décor, so that may take a while. I’ll come back and update as things get done though. I’ll share more pictures of the floors once I get the quarter round done. UPDATE: See how the desk turned out HERE! See the completed dining set HERE! Love the feet and fingers? haha…. Knobs!!! I love to see make overs and saving the land fills!!! AND you certainly get an award for that!!! So you painted this indoors… with a foam or bristle brush? Your painting is flawless. Great tiny distressing. 🙂 I always adore your makeovers. Inspiration for me with my new place where I am, after 1 week, in a tiny bit less of a sea of boxes. Storage is a challenge so I’ll get creative. All so very lovely! 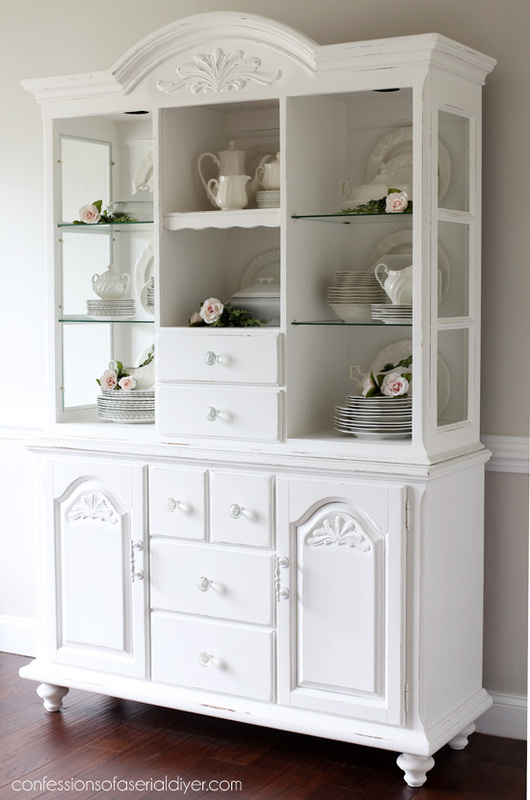 Gorgeous painted china hutch! You have been working soooo hard! Love what you have done. Can’t wait till see your next post! Good morning …. What is the name of your dish set? I received a couple pieces of the same set when my grandmother passed many years ago. I use the sugar bowl every morning …. sure brings back memories. Hi Linda! My collection is made up of pieces from a few different sets that I found thrifting, and unfortunately I don’t know the names of any of them. 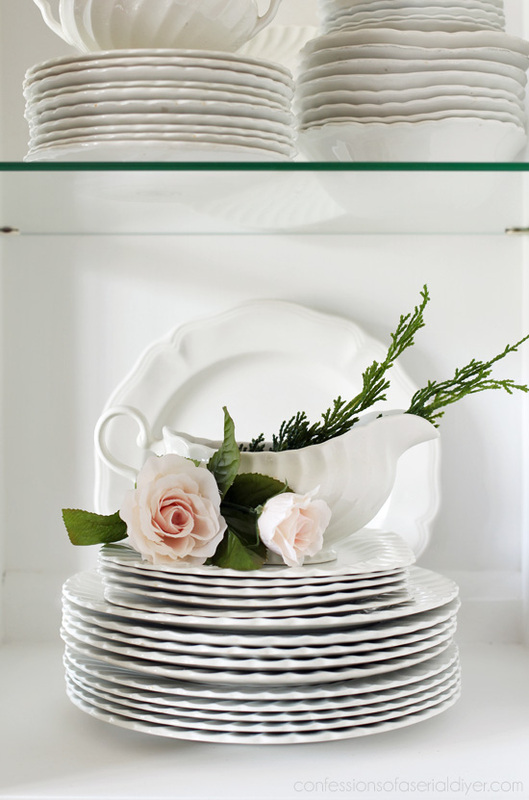 I just love ironstone, and almost never pass it up when I find a good deal on it. How nice that you have some pieces from your Grandmother to enjoy every day! I love the update! It was perfect timing that you shared this post. I just snagged a small hutch and was trying to decide what color to paint it. I love the legs you added. The hutch I got apparently had the bun style, which were missing, and I wanted to add new ones and that style will be perfect. Thanks! Well done! I love the change. 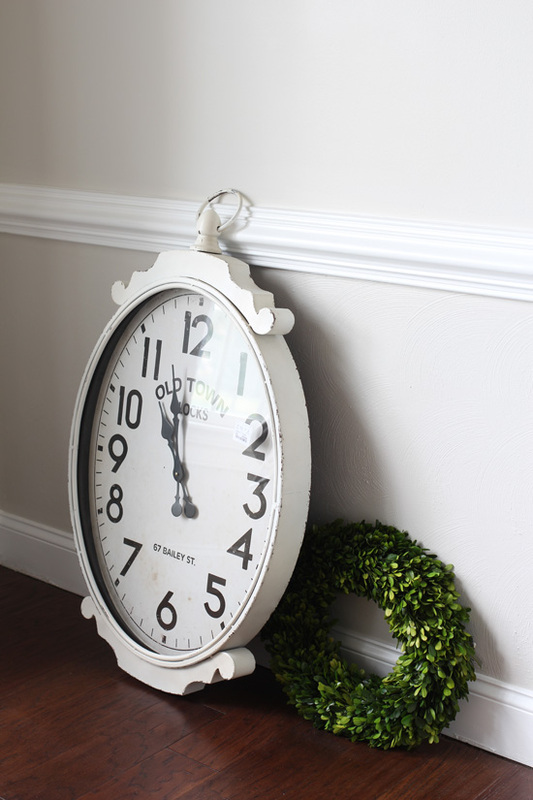 I am going to Home Goods to see if they have the clock which would look perfect in my kitchen. Thanks for sharing. I agree. I think the back of the cabinet needs a little texture/color. It looks great though! Thanks, Bex! Yep I think so too! You’ve been working hard and it shows, Christy. Fun to see the how the china cabinet has evolved. You were right about changing the color of the dining set, it really did turn yellow in that room. I vote for something colorful in the back of the hutch. Once you settle on a fabric for the chairs, it will guide you. I had to refinish my table/chair/hutch set when we moved in May as well! A lot of work, but totally worth it. I found the prettiest fabric on Amazon which was pretty affordable especially with prime shipping: https://www.amazon.com/gp/aw/d/B00FQLXZVO/ref=mp_s_a_1_1?ie=UTF8&qid=1510063745&sr=8-1&pi=AC_SX236_SY340_QL65&keywords=magnolia+homes+adele+fabric. The hutch is gorgeous! 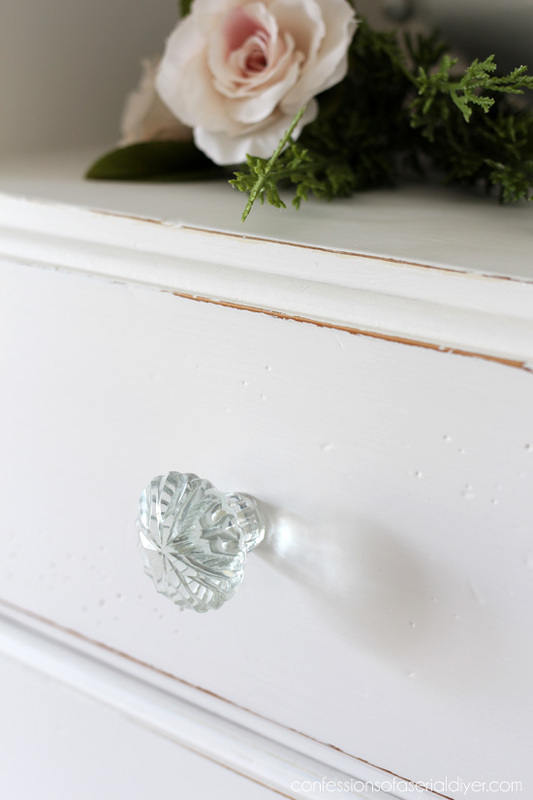 All the little details are perfect…love glass pulls and knobs. 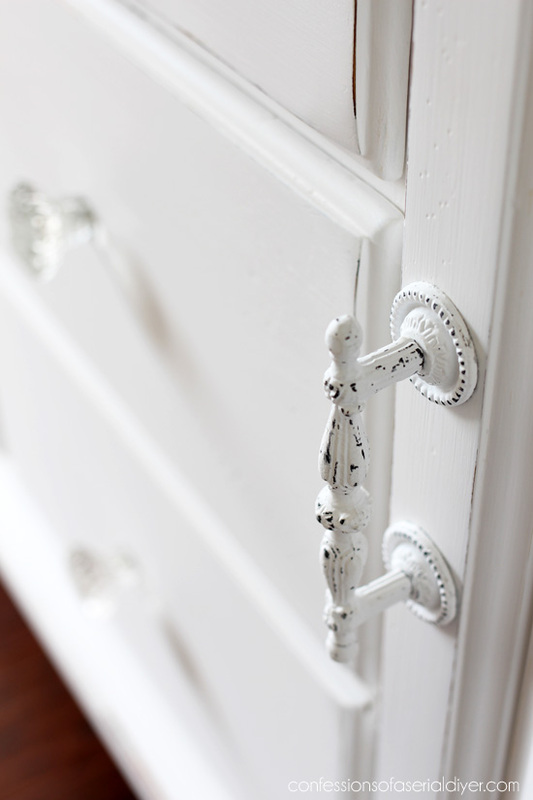 This is exactly what I love about painted furniture. You can make it whatever you want it to be at any time. You never have to buy new furniture once you figure out what you love. Beautiful re-do again of course. It looks so much fresher now. 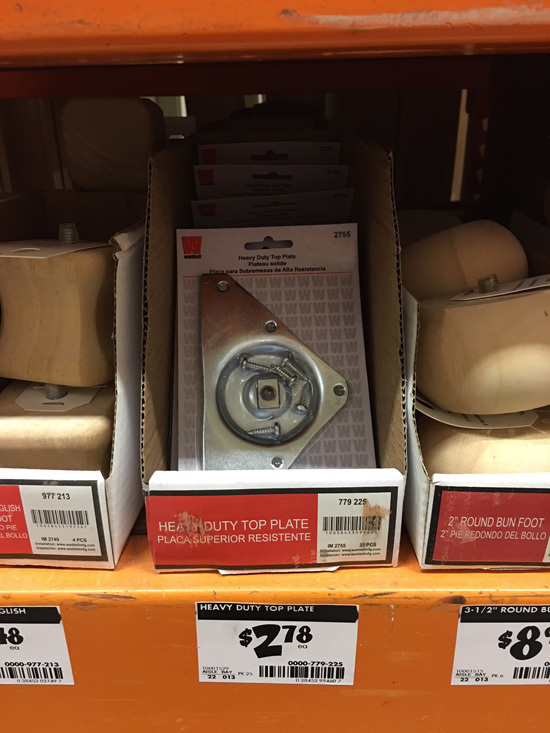 I love the new knobs and hardware – we have the same exact taste in this area. I am loving your new house and that we get to see you furnish it to make it your own. You are the hardest working person I know (I wish I really knew you in person). I love your ideas and creative mind. Your house looks like a magazine. Love the way the hutch looks now! I love the clean shabby chic look! You could go in so many different directions with the accent color on the back of the hutch & for the chairs, I don’t know how you’ll decide! I was going to do something similar to my hutch but my plans changed when I fell in love with a pic of an antique French armoire on Pinterest. With the help of my son in law I replace the glass sides and door inserts with 1/4′ plywood. 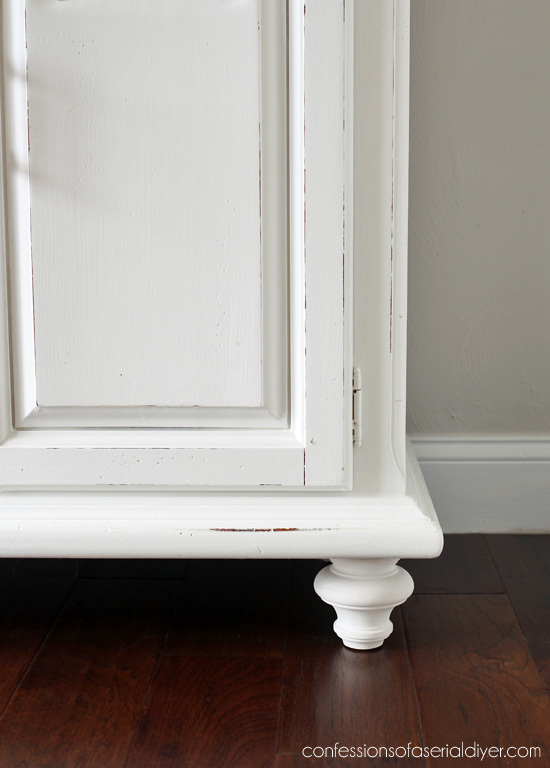 I added Efex trim pieces before painting with Annie Sloan Chalk paint. I used Pure White and a mix of clear/black wax (7/3 ratio), The result is an antique gray “armoire” that is perfect for my dining room. Looks wonderful, Christy! Love the new legs, and I bet you’ll find something lovely for the back. Wow what a beautiful job.. Are you going to put the chicken wire doors back up? I have a beautiful oak set my girls got me last Christmas and now know how I will do it thanks to you. You always seem to know just what is right or know just what you like and it ends up appealing to lots of people. Love, love, love the clock. I love, love the china cabinet now it so clean looking and the openness gives an updated look to it. They go together so beautifully! You should be so proud! Wow, this is gorgeous! I’m amazed at how the details that looked “cheap” and dated in the wood tone, look classy, timeless, and beautiful when painted! Not only is this piece beautiful, but I am astounded at how MUCH it can hold, haha! 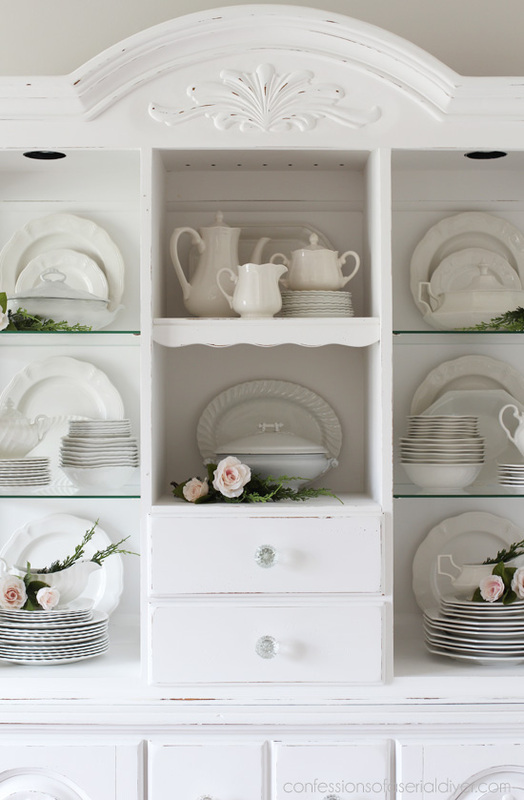 When I saw the “piles of dishes” picture I thought no way did you fit all of that into the hutch, you must store most of it and display favorites, but nope, there it all is! Amazing! 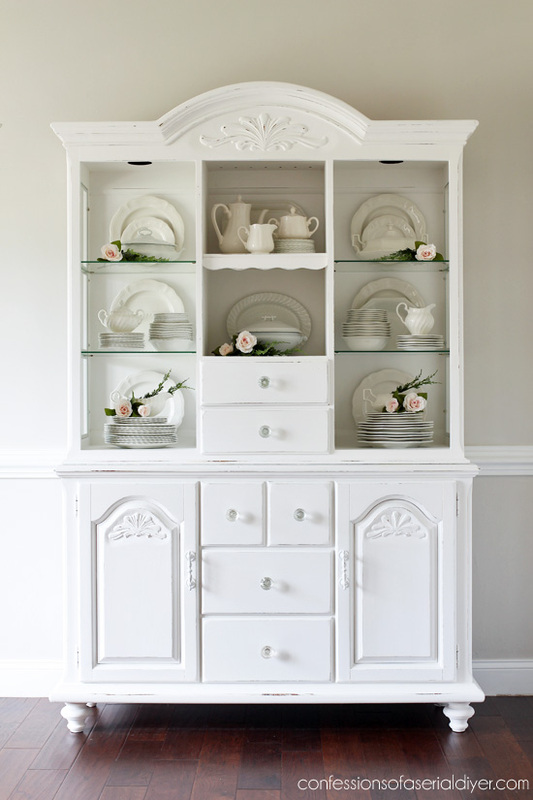 Christy, I think your china cabinet turned out beautifully! An easy and temporary way to add color to the back of a cabinet is to get some patterned poster board from Hobby Lobby, I chose a white with gold foil polka dots. They have several patterns to choose from. All I did was cut it to size and attach to cabinet with double sided tape. I’m very happy with my temporary fix! I love the new look and I would use whatever fabric you pick for your chairs as the “Pop” of color 😀 and whatever art you choose for the walls! 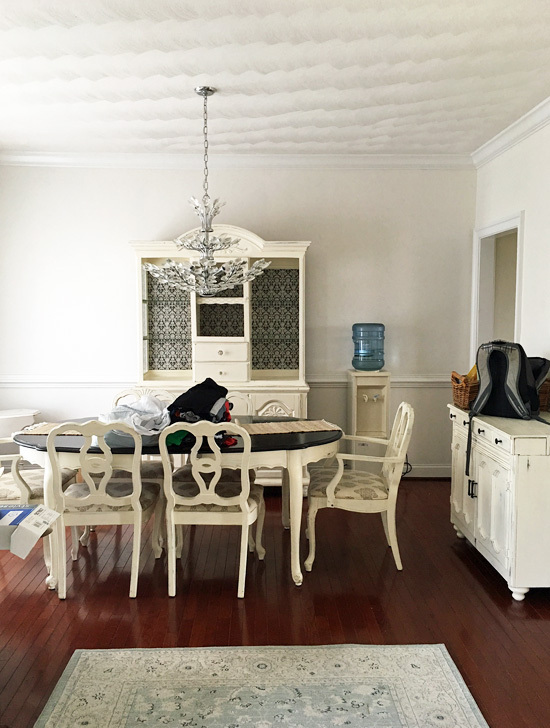 Love how you did your China cabinet…if I wanted to add legs to a sink vanity, what exactly would need to be done? Can I completely take the kickplate off around the bottom? Or should I just keep it & add 2 legs in front for a faux look? Help! Thanks, Sonya! 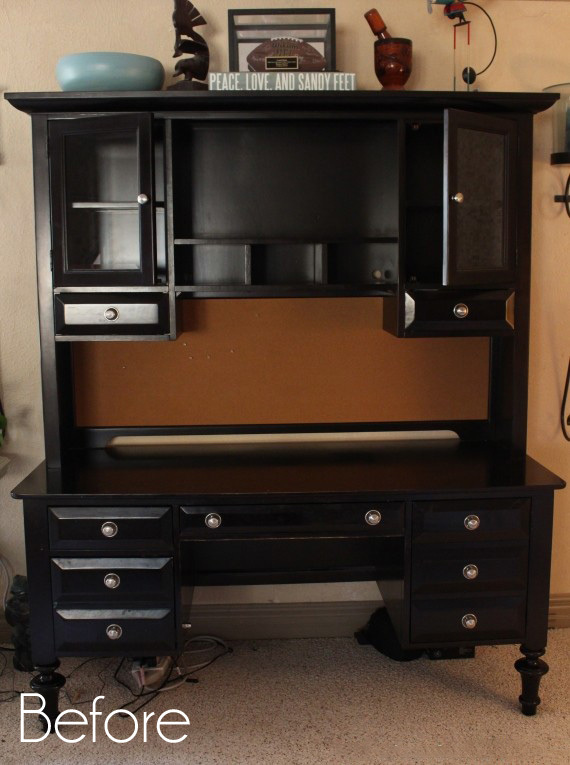 If you are using a standard vanity, you would probably have to leave the kickplate in place and do a faux look. I think it would still look great though! Christy it looks gorgeous, well done! 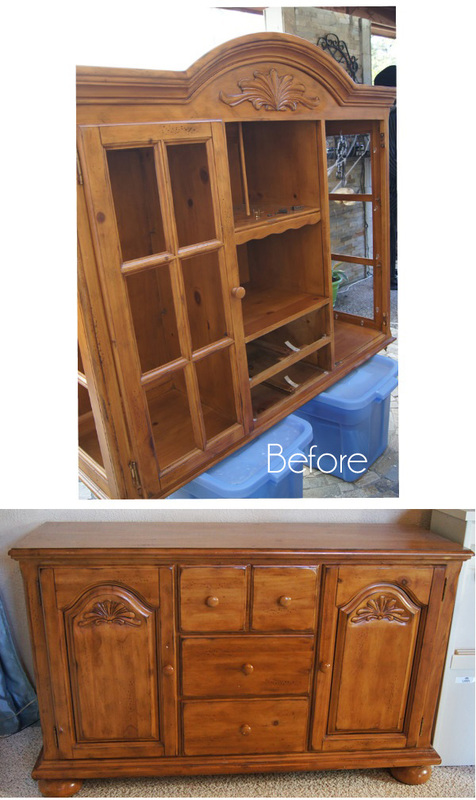 I love what you’ve done to your hutch! So pretty and refreshed! Have you considered putting bead board in the back where you are considering fabric? 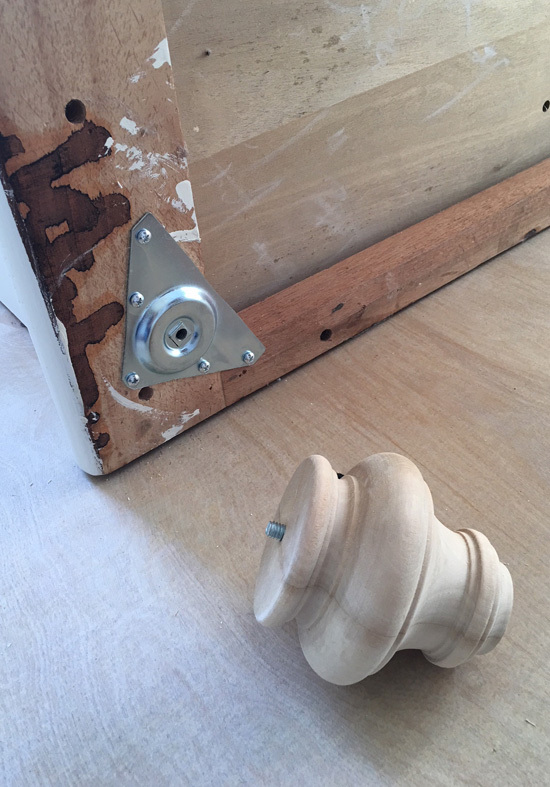 It comes in sheets, is easily cut, and easily wood glued and checked into place. It can be painted, and if you like wax can be worked into the grooves to give it more interest. 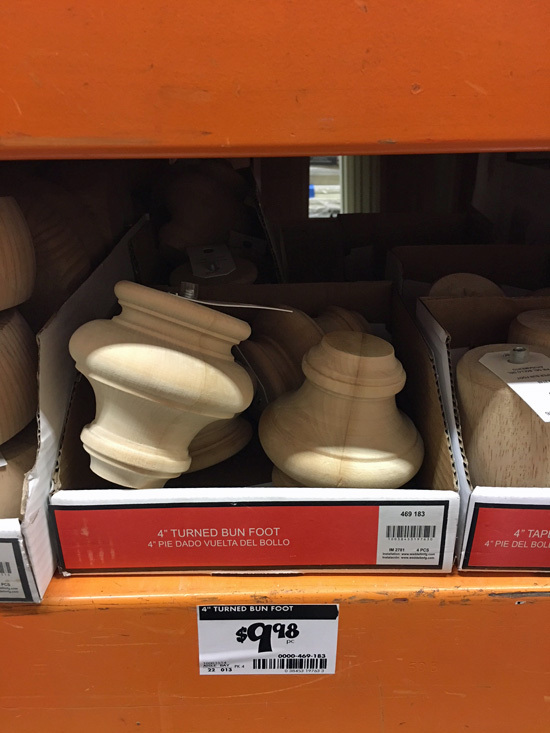 I have seen it used in both rustic and formal rooms, it adds texture and interest. I also love your dishes. 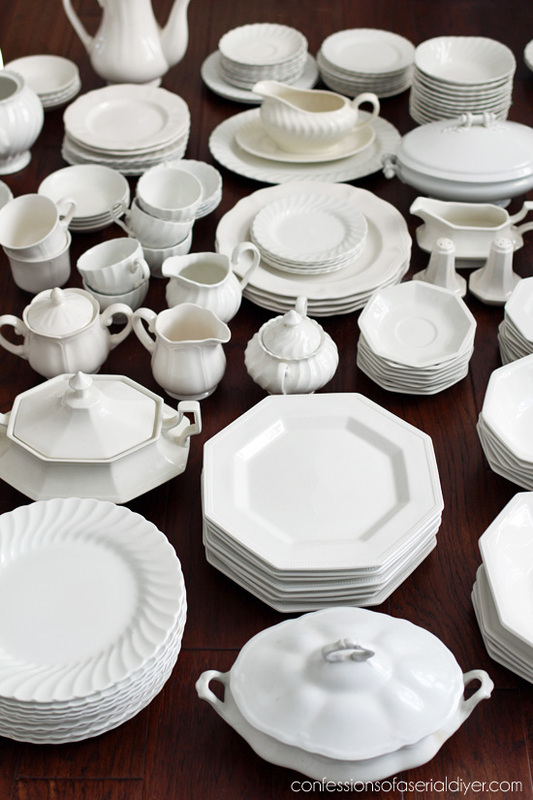 One of your sets was my every day China when I married many years ago. I believe it is Heritage by Johnson brothers. I’ve always loved it, and it’s very versatile. Nice refresh, Christy! I’ve always loved your hutch – I think it was the first post of yours that I ever read. You’re right, it does look much daintier and classic in a cool white, without the papered back. The new feet and hardware are a lovely touch as well. Another room I’m looking forward to seeing the final reveal!